Guns, Gore & Cannoli is a visually beautiful game with simple mechanics that engages the player through its short but enjoyable gameplay. You control a character called Vinnie, a hired gun who is searching for someone. Basic and not very interesting storyline, however it opens up as you progress through the game. You are dropped into things straight away as the boat you are travelling on is overrun with zombies and you have to fight your way out with only a pistol. 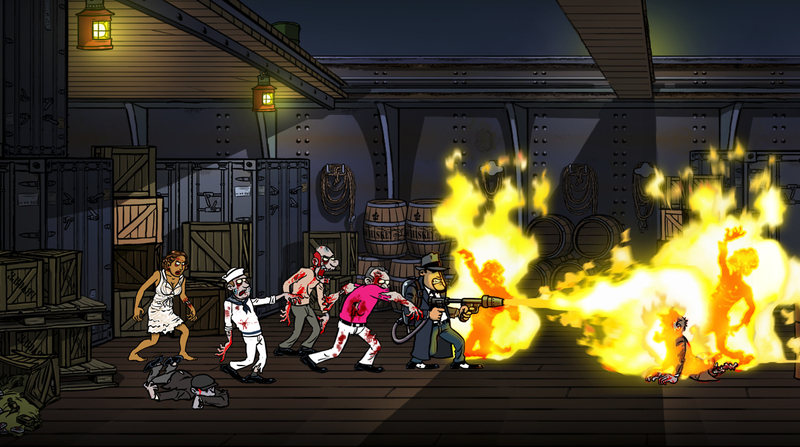 More guns can be found later on making you a better and more efficient zombie killing machine. The game itself is a 2D platformer, this is mixed with great animations and gory particle effects. This mixed with the cartoon-styled visuals effects brings it all together to a fantastic artistic achievement. It is highly satisfying when you score a headshot and you see their heads explode in all its glory. The mob-style character fits into the environment perfectly, as you explore you are immersed with the passing buildings and aesthetic surroundings in the 1920's setting for the game. The enemies themselves varies in their attacks and speed as they approach you making you think on your feet. This also adds strategy into your game, matching the correct gun to coincide with the situation you are in, get it wrong and you could be in trouble. Some of the enemies are Left 4 Dead-esque with poisonous gas enemies and larger enemies that blow up if hit hard enough. The arsenal at your disposal grows as you progress through the story, gaining bigger and highly effective weaponry to defeat anything that comes across your path. This encourages the user to carry on playing to see what the what the next surprise is and in my opinion is great video game development. Giving a player every gun straight off-the-bat may cause the player to become disinterested, which this game does not to. Another factor this game has of great design is the risk and reward system, guns and supplies are scattered, and sometimes are hard to reach without sufficient skill. Get it wrong and death or murderous mauling by zombies awaits, but get it right and you are blessed with a boost to progress. You will never run out of ammo due to the pistol having infinite ammo, the ammunition is for the other guns and are much more enjoyable to use. The game features local play up to 4 players so you can team up with your friends and kill zombies together or take a break in the deathmatch arena. This is a good distraction for a short while but can get stale fast. This is another game that does not support online multiplayer that this game could have greatly benefited from. 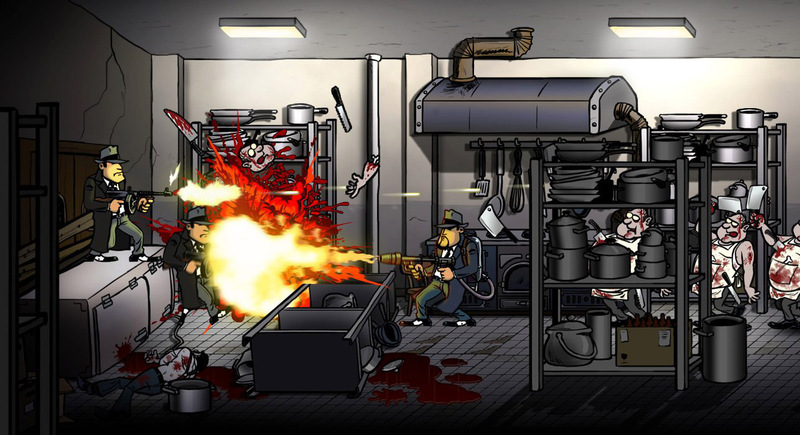 Guns, Gore and Cannoli is a great 2D platformer that integrates good gameplay with fast-pace strategy and tactics. Its lack of online multiplayer lets it down but that does not discourage it from being a great game and worthy of your hard earned money.